U.S. President Donald Trump met one-on-one with Russian President Vladimir Putin in Helsinki today. Read a full transcript of the news conference that followed that closed-door meeting. Distinguished Mr. President. Ladies and gentlemen. Negotiations with the President of the United States, Donald Trump, took place in a frank and businesslike atmosphere. I think we can call it a success and a very fruitful round of negotiations. We carefully analyzed the current status, the present and the future of the Russia-United States relationship, and key issues of the global agenda. It's quite clear to everyone that the bilateral relationship is going through a complicated stage; and yet those impediments, the tense atmosphere, essentially have no solid reason behind it. The Cold War is a thing of the past. The era of acute ideological confrontation between the two countries is a remote vestige of the past. The situation in the world has changed dramatically. Today's negotiations reflected our joint wish with President Trump to redress the negative situation in the bilateral relationship. I outlined the first steps for improving this relationship to restore an acceptable level of trust and going back to previous levels of interaction on all mutual interests. As major nuclear powers, we bear special responsibility for maintaining international security. It is vital — and we mentioned this during the negotiations — it is crucial that we fine-tune the dialect on strategic security and global security and non-proliferation of weapons of mass destruction. We submitted to our American colleagues a note with a number of specific suggestions. We believe it necessary to work together further to interact on the disarmament agenda and military and technical co-operation. This includes the extension of the strategic offensive arms limitation treaty. It's a dangerous situation with the global American anti-missile defence system, it's the implementation issues with the INF treaty, and, of course, the agenda of non-placement of weapons in space. We favour the continued co-operation in counterterrorism and maintaining cybersecurity. And I'd like to point out specifically that our special services are co-operating quite successfully together. The most recent example is their operational co-operation within the recently concluded World Cup. In general, the contacts among the special services should be put to a systemwide basis, should be brought to a systemic framework. I reminded President Trump about the suggestion to reestablish the working group on anti-terrorism. We also mentioned a plethora of regional crises. It's not always that our positions dovetail exactly — and yet the overlapping and mutual interests abound. We have to look for points of contact and interact closer in a variety of international forums. Clearly, we mentioned the regional crisis in Syria. As far as Syria is concerned, the task of establishing peace and reconciliation in this country could be the first showcase example of our successful joint work. Russia and the United States apparently can act proactively and take leadership on this issue and organize the interaction to overcome the humanitarian crisis and help Syrian refugees to go back to their homes. In order to accomplish this level of successful co-operation in Syria, we have all the required components. Let me remind you that. Both Russian and American military have acquired the useful experience of co-ordination of their action, established the operational channels of communication, which permit us to avoid dangerous incidents and unintentional collisions in the air and on the ground. Also crushing terrorists in the southwest of Syria. The south of Syria should be brought to the full compliance with the treaty of 1974, about the separation of forces of Israel and Syria. This will bring peace to the Golan Heights, and bring a more peaceful relationship between Syria and Israel, and also to provide security of the state of Israel. Mr. President [Trump] paid special attention to the issue during today's negotiations, and I would like to confirm that Russia is interested in this development and thus will act accordingly. Thus, we will make a step toward creating a lasting peace in compliance with the respective resolutions of Security Council — for instance, Resolution 338. We're glad that Korean Peninsula issue is starting to resolve. To a great extent, it was possible thanks to the personal involvement of President Trump, who opted for dialogue instead of confrontation. We also mentioned our concern about the withdrawal of the United States from the JCPOA. Our U.S. counterparts are aware of our position. Let me remind you that thanks to the Iranian nuclear deal, Iran became the most controlled country in the world. It submitted to the control of the IAEA. It effectively ensures the peaceful nature of the Iran nuclear program and strengthens the non-proliferation regime. While we discussed the internal Ukrainian crisis, we paid special attention to the bona fide implementation of Minsk agreements by Kyiv. At the same time, the United States could be more decisive in nudging the Ukrainian leadership and encouraging them to work actively. We paid more attention to economic ties and economic co-operation. It's clear that both countries — and the businesses of both countries — are interested in this. The American delegation was one of the largest delegations at the St. Petersberg Economic Forum. It featured over 500 representatives from American businesses. We agreed, me and President Trump, we agreed to create a high-level working group that will bring together captains of Russian and American business. After all, entrepreneurs and businessmen better know how to articulate this successful business co-operation, to think and make proposals in this regard. Once again, President Trump mentioned the issue of the so-called interference of Russia in the American elections, and I had to reiterate things I said several times, including during our personal contact: That the Russia state has never interfered — and is not going to interfere — in internal American affairs, including the election process. Any specific material, if such things arise, we are ready to analyze together. For instance, we can analyze them through the joint working group on cybersecurity, the establishment of which we discussed during our previous contact. And clearly, it's past time we restore our co-operation in the cultural area, in the humanitarian area. I think you know that recently we hosted an American congressmen delegation, and now it's perceived as almost a historic event — although it should have been just business as usual. In this regard, we mentioned this proposal to the president, but we have to think about practicalities of our co-operation, but also about rationale, the underlying logic of it. And we have to engage experts on bilateral relationships who know history and the background of our relationship. The idea is to create an expert council that would include political scientists, prominent diplomats and former military experts in both countries who would look for points of contact between the two countries and look for ways on putting the relationship on the trajectory of growth. In general, we are glad with the outcome of our first full-scale meeting because previously, we only had a chance to talk briefly on the international floor. We had a good conversation with President Trump, and I hope we start to understand each other better. And I am grateful to Donald for it. Clearly we had some challenges where we were not able to clear the backlog, but I think we made a first important step in this direction. In conclusion, I want to point out that this atmosphere of co-operation is something that we are especially grateful for [when it comes] to our Finnish hosts. We are grateful to the Finnish people and Finnish leadership for what they've done. I know we've caused some inconvenience to Finland and we apologize for it. Thank you. I also want to congratulate Russia and President Putin for having done such an excellent job in hosting the World Cup. It was really one of the best ever, and your team also did very well. It was a great job. I'm here today to continue the proud tradition of bold American diplomacy. From the earliest days of our republic, American leaders have understood that diplomacy and engagement is preferable to conflict and hostility. A productive dialogue is not only good for the United States and good for Russia, but it is good for the world. The disagreements between our two countries are well-known, and President Putin and I discussed them at length today. But if we're going to solve many of the problems facing our world, then we're going to have to find ways to co-operate in pursuit of shared interests. Too often in both the recent past and long ago, we have seen the consequences when diplomacy is left on the table. We have also seen the benefits of co-operation. And last century, our nations fought alongside one another in the Second World War. Even during the tensions of the Cold War, when the world looked much different than it does today, the United States and Russia were able to maintain a strong dialogue. However, that changed as of about four hours ago. I really believe that. Nothing would be easier politically than to refuse to meet, to refuse to engage. But that would not accomplish anything. Constructive dialogue between the United States and Russia affords the opportunity to open new pathways toward peace and stability in our world. I would rather take a political risk in pursuit of peace than to risk peace in pursuit of politics. As president, I will always put what is best for America and what is best for the American people [first]. During today's meeting, I addressed directly with President Putin the issue of Russian interference in our elections. I felt this was a message best delivered in person. Spent a great deal of time talking about it, and President Putin may very well want to address it — and very strongly, because he feels very strongly about it, and he has an interesting idea. We also discussed one of the most critical challenges facing humanity: nuclear proliferation. I provided an update on my meeting last month with Chairman Kim [Jong-un] on the denuclearization of North Korea. And after today, I am very sure that President Putin and Russia want very much to end that problem. Going to work with us and I appreciate that commitment. Last year, we told Russia about a planned attack in St. Petersburg, and they were able to stop it cold. They found them; they stopped them; there was no doubt about it. I appreciated President Putin's phone call afterward to thank me. As we discussed at length, the crisis in Syria is a complex one. Co-operation between our countries has the potential to save hundreds of thousands of lives. We also agreed that representatives from our national security councils will meet to follow up on all of the issues that we addressed today, and to continue the progress we have started right here in Helsinki. Today's meeting is only the beginning of a longer process, but we have taken the first steps toward a brighter future and one with a strong dialogue and a lot of thought. Our expectations are grounded in realism, but our hopes are grounded in America's desire for friendship, co-operation and peace. And I think I can speak on behalf of Russia when I say that also. President Putin, I want to thank you again for joining me for these important discussions and for advancing open dialogue between Russia and the United States. Our meeting carries on a long tradition of diplomacy between Russia and the United States, for the greater good of all. And this was a very constructive day, this was a very constructive few hours that we spent together. It's in the interest of both our countries to continue our conversation, and we have agreed to do so. I'm sure we'll be meeting again in the future often, and hopefully, we will solve every one of the problems that we discussed today. Reporter question: I have a question for President Trump. During your recent European tour, you mentioned that the implementation of the Nord Stream 2 gas pipeline makes Europe a hostage of Russia, and you suggested that you could free Europe from this by supplying American LNG. But this cold winter actually showed that the current model, that the current mechanism of supplying fuel to Europe is quite viable. At the same time, as far as I know, the U.S. even had to buy Russian gas for Boston. Does the implementation of your idea have a political tinge to it? Or is it a practical one? Because there will be a gap formed in the supply and demand mechanism. And it's the consumer countries that will fall into this gap. And a second question: Before the meeting with President Putin, you called him an adversary, a rival. And yet you expressed hope that you will be able to bring this relationship to a new level. Did you manage to do this? Trump: Actually, I called him a competitor, and a good competitor he is. And I think the word competitor is a compliment. I think that we will be competing when you talk about the pipeline. I'm not sure necessarily that it's in the best interests of Germany or not, but that was a decision that they made. We'll be competing. As you know, the United States is now — or soon will be, but I think it actually is right now — the largest in the oil and gas world. So we're going to be selling LNG, and we'll have to be competing with the pipeline. And I think we'll compete successfully, although there is a little advantage locationally. So I just wish them luck. I did. I discussed with Angela Merkel in pretty strong tones, but I also know where they are all coming from, and they have a very close source. So we'll see how that all works out. But we have lots of sources now, and the United States is much different than it was a number of years ago, when we weren't able to extract what we can extract today. So today we're number one in the world at that, and I think we'll be out there competing very strongly. Thank you very much. Putin: If I may, I'd throw in my two cents. We talked to the president about this subject, as well. We are aware of the stance of President Trump, and I think that we, as a major oil and gas power, and the United States, as a major oil and gas power as well, we could work together on regulation of international markets. Because neither of us is actually interested in the plummeting of prices. The consumers will suffer as well, and the consumers in the United States will suffer, and the shale gas production will suffer. Because beyond a set price breakout, it's no longer profitable to produce gas. Nor are we interested in driving prices up, because it will drain life juices from all other sectors of the economy — from machine building, et cetera. So we do have space for co-operation here; that's the first thing. Then about the Nord Stream 2. Mr. President [Trump] voiced his concerns about the possibility of disappearance of transit through Ukraine, and I reassured Mr. President that Russia stands ready to maintain this transit. Moreover, we stand ready to extend this transit contract that's about to expire next year in case — if the dispute between the economic entities will be settled in the Stockholm arbitration court. Reporter question: Mr. President [Trump]: You tweeted this morning that it's U.S. foolishness, stupidity and the Mueller probe that is responsible for the decline in U.S. relations with Russia. Do you hold Russia at all accountable for anything in particular? And if so, what would you consider them that they are responsible for? Trump: Yes, I do. I hold both countries responsible. I think that the United States has been foolish. I think we've all been foolish. We should have had this dialogue a long time ago — frankly, before I got to office. And I think we're all to blame. I think that the United States now has stepped forward, along with Russia. And we're getting together, and we have a chance to do some great things, whether it's nuclear proliferation, in terms of stopping [it], which we have to do. And ultimately I think that's probably the most important thing that we can be working on. There was no collusion at all. Everybody knows it, and people are being brought out to the fore. So far that I know, virtually none of it related to the campaign. And they're going to have to try really hard to find somebody that did relate to the campaign. It was a clean campaign. I beat Hillary Clinton easily. And frankly, we beat her. And i'm not saying even from the standpoint — we won that race — and it's a shame that there can be a little bit of a cloud over it. People know that, people understand it. But the main thing — and we discussed this also — is zero collusion. And it has had a negative impact upon the relationship of the two largest nuclear powers in the world. We have 90 per cent of nuclear power between the two countries. It's ridiculous; it's ridiculous what's going on with the probe. Reporter question: For President Putin, if I could follow up, as well. Why should Americans and why should President Trump believe your statement that Russia did not intervene in the 2016 election, given the evidence that U.S. intelligence agencies have provided? And will you consider extraditing the 12 Russian officials that were indicted last week by a U.S. grand jury? Trump: Well, I'm going to let the Russian president answer the second part of that question. But as you know, the whole concept of that came out — perhaps a little bit before — but it came out as a reason why the Democrats lost an election, which frankly, they should have been able to win. Because the electoral college is much more advantageous for Democrats, as you know, than it is to Republicans.We won the electoral college by a lot: 306 to 223, I believe. And that was a well-fought battle. We did a great job. And frankly, I'm going to let the president speak to the second part of your question. But just to say it one time again — and I say it all the time: There was no collusion. I didn't know the president. There was nobody to collude with. There was no collusion with the campaign. And every time you hear all of these, you know, 12 and 14 [indictments], it's stuff they had nothing to do — and frankly, they admit — these are not people involved in the campaign. But to the average reader out there, they're saying well, maybe that does. It doesn't. And even the people involved, some perhaps told mis-stories — though in one case, the FBI said there was no lie, there was no lie. Somebody else said there was. Putin: As to who is to be believed and to who is not to be believed, you can trust no one. Where did you get this idea that President Trump trusts me or I trust him? He defends the interests of the United States of America, and I defend the interests of the Russian Federation. We do have interests that are common; we are looking for points of contact. There are issues are where our positions are diverse, and we are looking for ways to reconcile our differences — how to make our efforts more meaningful. Could you name a single fact that would definitively prove collusion? It's nonsense, just like the president just mentioned. Yes, the public at large in the United States had a certain perceived opinion of the candidates during the [U.S. election] campaign, but that's nothing particularly extraordinary about that. It's a usual thing. 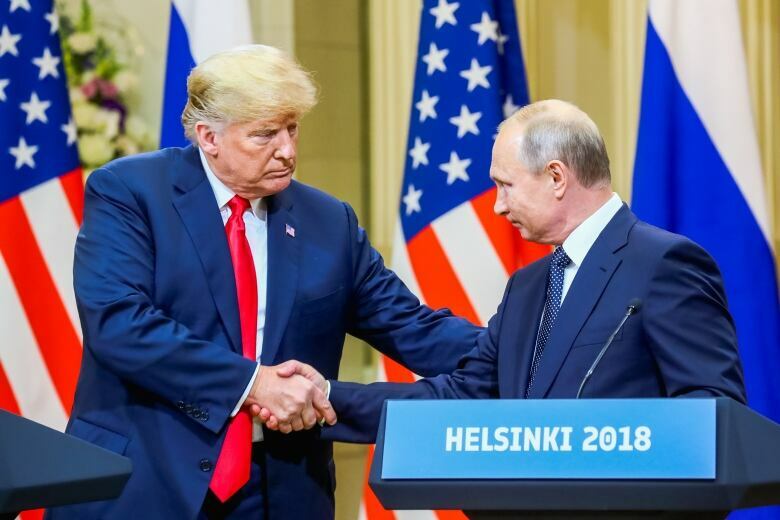 President Trump, when he was a candidate, he mentioned the need to restore the Russia-U.S. relationship, and it's clear that some part of American society felt sympathetic about that. And different people can express their sympathies in different ways. But isn't it natural to be sympathetic toward someone who is willing to restore the relationship with our country, who wants to work with us? We heard the accusations about the Concord [Management] company. As far as I know, this company hired American lawyers, and the accusation doesn't have a fighting chance in the American courts. So there's no evidence when it comes to the actual facts. So we have to be guided by facts, not by rumours. Now let's get back to the issue of these 12 alleged intelligence officers of Russia. I don't know the full extent of the situation, but President Trump mentioned this issue, and I will look into it. So far I can say the following off the top of my head: We have an acting and existing agreement between the United States of America and the Russian Federation an existing treaty that dates back to 1999. The mutual assistance on criminal cases: this treaty is in full effect, it works quite efficiently. On average, we initiate about 100 to 150 criminal cases upon requests from foreign states. For instance, last year, there was one extradition case upon request sent by the United States. So this treaty has specific legal procedures. We can offer that the appropriate commission headed by special attorney Mueller, he can use this treaty ... and send a formal, an official request to us so that we would interrogate, hold a questioning of, these individuals who he believes are privy to some crimes. And our law enforcement are perfectly able to do this questioning and send the appropriate material to the United States. For instance, we can bring up Mr. [Bill] Browder. Business associates of Mr. Browder have earned over $1.5 million in Russia. They have paid no taxes — neither in Russia or the United States. And yet the money escaped the country. While that's their personal choice — it might have been legal, the contribution itself — but the way the money was earned was illegal. So we have some reason to believe that some intelligence officers accompanied and guided these transactions, and we have an interest in questioning them. Reporter question: Did you want President Trump to win the election? And did direct any of your officials to help him do that? Putin: Yes I did, yes I did. Because he talked about bringing the U.S.-Russia relationship back to normal. Reporter question: A question to President Trump: Would you please go into the details of possibly any specific arrangements for the U.S. to work together with Russia in Syria, if any of these kinds of arrangements were made today or discussed? And a question to President Putin: Since we brought up the issue of football several times, I'll use the language of football. Mr. Pompeo mentioned that when we talk about the Syrian co-operation, the ball is in Syria's court. Mr. Putin, in Russian court. Is that true? And how would you use this fact? Trump: Well, I guess I'll answer the first part of the question. We've worked with Israel long and hard for many years, many decades. I think never has anyone, any country been closer than we are. President Putin also is helping Israel, and we both spoke with Bibi Netanyahu, and they would like to do certain things with respect to Syria, having to do with the safety of Israel. So in that respect, we absolutely would like to work in order to help Israel, and Israel will be working with us. So both countries would work jointly. And I think that when you look at all of the progress that's been made in certain sections: with the eradication of ISIS — we're about 98 per cent, about 99 per cent there — and other things that have taken place that we've done. And frankly, Russia has helped us with in certain respects. But I think working with Israel is a great thing and creating safety for Israel is something that both President Putin and I would like to see very much. One little thing I might add to that is the helping of people. Because you have such horrible — if you see, and I've seen reports, and I've seen pictures, I've seen just about everything. And if we can do something to help the people of Syria get back into some form of shelter on a humanitarian basis. And that's what the word was, really: humanitarian basis. I think that both of us would be really interested in doing that. And we will do that. Thank you very much. Reporter question (follow): But for now no specific agreements, for instance, between the militaries? Trump: Well, our militaries do get along. In fact, our militaries actually have gotten along probably better than our political leaders for years. But our militaries do get along very well, and they do co-ordinate in Syria and other places. Okay. Thank you. Putin: Yes, we did mention this. We mentioned the humanitarian track of this issue. Yesterday, I discussed this with French President Mr. [Emmanuel] Macron and we reached an agreement that together with European countries, including France, we will step up this effort. And now, we provide military aircraft to deliver the humanitarian cargo. And today I brought up this issue with President Trump. I think there are plenty of things to look into. The crucial thing here is the huge amount of refugees that are in Turkey, in Lebanon, in Jordan — in the states that border or are adjacent to Syria. If we help them, the migration pressure upon the European states will be decreased many fold, and I believe it's crucial from any point of view: from the humanitarian point of view, from the point of view of helping people, helping refugees. In general, I agree with President Trump that our militaries co-operate quite successfully together. They do get along, and I hope they will be able to do so in future. And we will keep working in the format — Russia, Turkey and Iran — which I informed President Trump about. But we do stand ready to link these efforts to the so-called small group of states so that the process would be a broader one, be a multidimensional one, and so that we will be able to maximize our fighting chance to get the ultimate success on the issue of Syria. 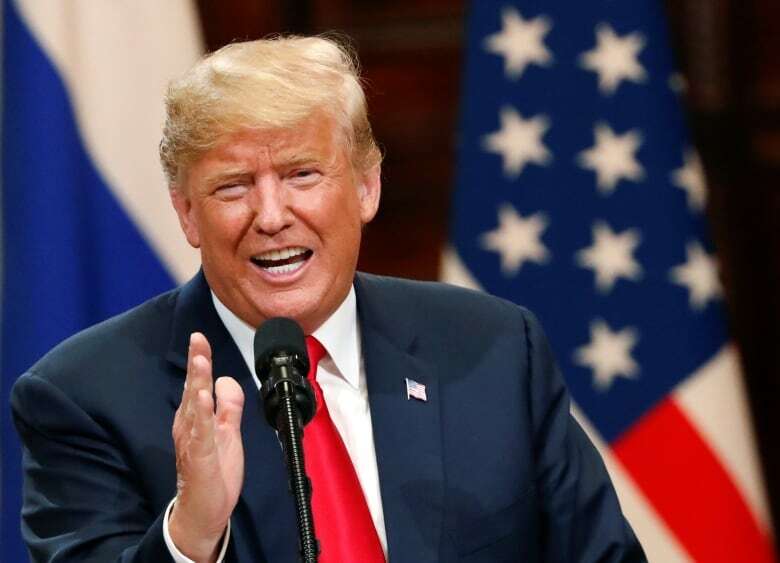 And speaking about having the ball in our court in Syria, President Trump has just mentioned that we've successfully concluded the World Cup. 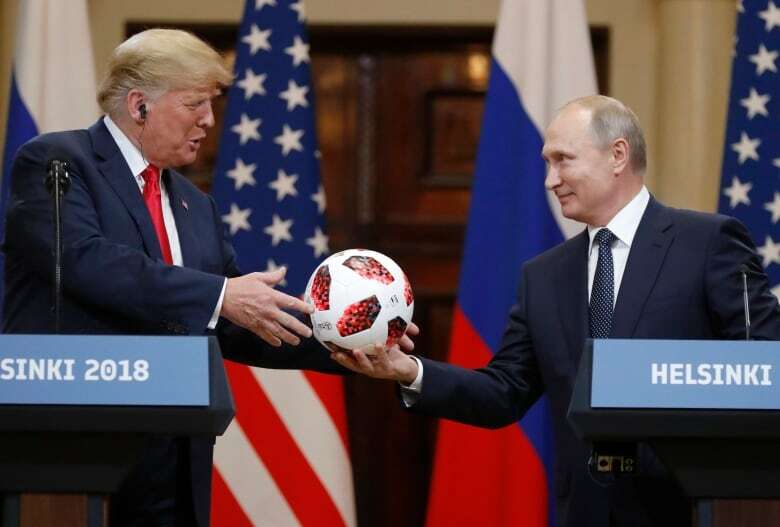 Speaking of the football, actually, Mr. President, I'll give this ball to you. And now the ball is in your court — all the more that the United States will host the World Cup in 2026. Trump: That's right. Thank you very much. We do host it, and we hope we do as good a job. That's very nice. That will go to my son, Barron. No question. In fact, Melania? There you go. Reporter question: Thank you. Question for each president. President Trump, you first. Just now, President Putin denied having anything to do with the election interference in 2016. Every intelligence agency has concluded that Russia did. My first question is, sir: who do you believe? My second question is: would you, with the whole world watching, tell President Putin, would you denounce what happened in 2016 and would you warn him to never do it again? Trump: So let me say we have two thoughts. You have groups that are wondering why the FBI have never taken the server. Why haven't they taken the server? Why was the FBI told to leave the office of the Democratic National Committee? I've been wondering that, I've been asking that for months and months. And I've been tweeting it out and calling it out on social media. Where is the server? I want to know. Where is the server and what is the server saying? With that being said, all I can do is ask the question. My people came to me — Dan Coats came to me and some others — and they said they think it's Russia. I have President Putin — he just said it's not Russia. I will say this: I don't see any reason why it would be, but I really do want to see the server. But I have confidence in both parties. I really believe that this will probably go on for awhile, but I don't think it can go on without finding out what happened to the server. What happened to the servers of the Pakistani gentleman that worked on the DNC? Where are the servers? They're missing. Where are they? What happened to Hillary Clinton's emails? 33,000 emails gone, just gone. I think in Russia, they wouldn't be gone so easily. I think it's a disgrace that we can't get Hillary Clinton's 33,000 emails. So I have great confidence in my intelligence people. But I will tell you that President Putin was extremely strong and powerful in his denial today. And what he did do is an incredible offer: he offered to have the people working on the case come and work with their investigators with respect to the 12 people. I think that's an incredible offer. Thank you. Putin: I'd like to add something to this. After all, I was an intelligence officer myself and I do know how dossiers are made. Just the first thing. Now the second thing. I believe that Russia is a democratic state, and I hope you're not denying this right to your own country, you're not denying that United States is democracy. Do you believe that United States is a democracy? And if so, if it is a democratic state, then the final conclusion in this kind of dispute can only be delivered by a trial, by the court — not exacted by intelligence, by law enforcement. For example, the Concord company that was brought up has been accused of interference. But this company constituted the Russian state, it does not represent the Russian state. And I've brought several examples before. Well, you have a lot of individuals in the United States. Take George Soros, for example, with multi-billions of dollars in capital. But does it make his position the position of the United States? No, it does not. It's the same case. There is the issue of trying the case in the court — and the final say is for the court to deliver. We're now talking about the private individuals and not about particular states. And as far as the most recent allegations are concerned about the Russian intelligence officers, we do have an intergovernmental treaty. Please do send us the request. We will analyze it properly and we'll send a formal response. And as I said, we can extend this co-operation. But we should do it on a reciprocal basis, because we would await our Russian counterparts to provide access to the persons of interest for us who we believe can have something to do with intelligence status. Let us discuss specific issues and not use the U.S.-Russian relationship for this internal political struggle. Reporter question: A question for President Putin. Two questions for you sir. Can you tell me what President Trump may have indicated to you about officially recognizing Crimea as part of Russia? And secondly sir, does the Russian government have any compromising material on President Trump or his family? Putin: Well, the position of President Trump on Crimea is well-known and he stands firmly by it. He continues to maintain that it was illegal to annex it. Our viewpoint is different. We held a referendum in strict compliance with the UN charter and the international legislation. For us, we put paid to this issue. 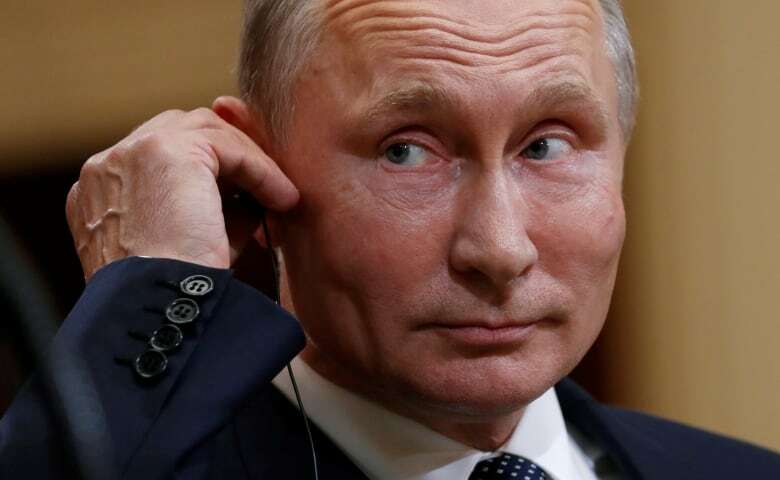 And now to the compromising material: Yes, I did hear these rumours that we allegedly collected compromising material on Mr. Trump when he was visiting Moscow. Well, let me tell you this: When President Trump was in Moscow back then, I didn't even know that he was in moscow. I treat President Trump with utmost respect, but back then, when he was a private individual, a businessman, nobody informed me that he was in Moscow. Let's take the St. Petersburg Economic Forum, for instance. There was over 500 American businessmen — the high-ranking, the high-level ones. I don't even remember the last names of each and every one of them. Do you really think that we tried to collect compromising material on each and every single one of them? Well, it's difficult to imagine nonsense on a bigger scale than this. Please just disregard this issue and don't think about it any more again. Trump: And I have to say, if they had it, it would have been out long ago. If anybody watched Peter Strzok testify over the last couple of days — and I was in Brussels watching it — it was a disgrace to the FBI, it was a disgrace to our country, and you would say that was a total witch hunt. Thank you very much, everybody. Thank you.